Whale watching (seasonal) - St. Lucia has the highest recorded boat-based whale sightings in South Africa. The tours are either early morning or later in the afternoon. The whales frequent these warm waters of the Indian Ocean where mating takes place (which makes for a lot more activity) before calving in the colder waters of the Cape. From June to end of November & R495-00 P/P. (Two-third refund if no whales are spotted after 2 hrs at sea. Turtle Tours (seasonal) - Witness this miracle of nature where the Leatherback & Loggerhead Turtles return to lay their eggs on the very same beach they were born. The tour includes a night drive in St. Lucia Wetlands Park and is tide dependant. From November through to mid-January for nesting and thereafter the hatchlings returning to the ocean can be seen for a few months or so afterwards. 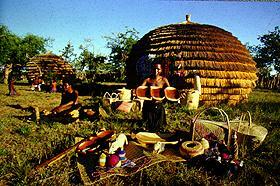 Zulu Cultural Village - En-route to the Hluhluwe game reserve is the Dumazulu Cultural experience. This "living museum" has the distinction of being the only Zulu village that has the Zulu King Goodwill Zwelitini`s stamp of approval. The village has appr. 50 Zulu inhabitants which live on the premises and each guided tour has demonstrations of Zulu customs, from witchdoctors to homemade local beer being offered for taste. The highlight is a spectacular Zulu dance which is awesome & vibrant. Lunch is served with a blend of both traditional South African & Zulu cuisine. There is a bar facility as well as a great variety of curios in a well stocked shop. Cape Vidal - This magnificent unspoiled beach lies 32 km`s out of St. Lucia village with easy access on tarred road. En-route to Cape Vidal you travel through the St. Lucia Wetland Park on the Eastern Shores of Lake St. Lucia which abounds in game, especially Rhino close to the road. See the world's highest vegetated sand dunes & walk through sand dune forests with a tremendous variety of birdlife. 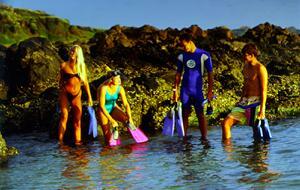 Snorkel at Vidal in the warm Indian Ocean, sunbathe on clean beaches or try your hand at some surf or fly-fishing. Arrange for a picnic style take-away breakfast with your lodging as tours leave early. Big 5 Game Reserves - Depart St. Lucia for a mere 35 minutes drive to the adjoining world famous Hluhluwe/Umfolozi game reserve. Here you can can expect to see the big 5 & especially Rhino up close, as these reserves have the biggest population of rhino in the world. Enjoy either a South African Barbecue for lunch at a picnic spot in the park or dine at the Hilltop restaurant in Hluhluwe with full bar facilities as well as curio shopping. Birding - More than two thirds of South Africa's entire bird population is found in the Greater St. Lucia Wetland Park. Early morning or late afternoon outings to explore birds which are rarely sighted in other parts of South Africa are arranged with competent guides. The bird species found in St. Lucia cover a variety of habitat ranging from fauna, flora, wetlands, grasslands, Lake St. Lucia, coastal, forest and migratory. The surrounding nature with abundant birdlife makes St. Lucia a paradise for birding. Horse Riding - on the Eastern Shores of the St. Lucia Wetland Park led by experienced rider-guides who will assist inexperienced horse-riders. Get close to animals on horseback whilst exploring nature in a conservation area off limits to the general public. Enjoy bush trails or opt for some beach riding when available. 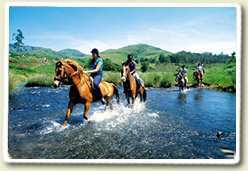 Bhangazi Horse Trails offer rides on the Western Shores of St. Lucia in the False Bay area including overnight horse trails with accommodation which is set up for you in tents along the trail. This outdoor camping experience in a World Heritage status park with prolific animal & birdlife is a must for outdoor enthusiasts. The horse trails includes meals. World Heritage Tour - on the eastern shores of the St. Lucia Wetland Park which is situated between lake St. Lucia & the Indian Ocean. This is a very interesting & detailed ecological tour of the Park which explores the various species in relation to world heritage site status granted to the Park. The tour also takes you to Cape Vidal for some swimming, snorkeling & a traditional barbecue for lunch. The whole ecology of the park as well as the relation between different species is discussed in detail. Part of the tour is spent game viewing & birding. 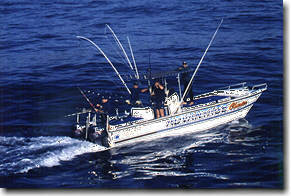 Deep Sea Fishing - either off the St. Lucia coastline or chartered deep sea trips from Cape Vidal. St. Lucia has many deep sea tour operators with some skippers having operated in these waters for decades. Costs are in the region of R450-00 to R475-00 per seat for the whole day which includes angling equipment & bait. Spend time trawling and bottom fishing with some exciting bill & sail fish being landed from time to time. There is always the opportunity to sell back your excess catch of the day. Alcohol is not allowed on charters and you would need to arrange your own food & drinks for the day, including sunblock!